Living in the city we see daily the reverence and attention that people give to their dogs. At our nearby harbour-side dog park there’s rich energy – frivolous, wild, serious things happen between the dogs down there (and between their owners!) Despite our lives becoming increasing embedded in the infrastructures of the city and technology, dogs seem to draw their owners into another realm. We’re deeply connected to dogs in some ways… as James Hillman pointed out: “those incisors in our own mouths are canines”. The dog is a domesticated contemporary of the ancient wolf – yet still sufficiently natural, unrepressed and direct in its action to both please with its licks and shock with its inappropriate sniffs! In this post we’d like to explore the dog as symbol and the dog in dream; in our own dreams, and in the dreams of others. It’s the first post in a new blog category: Soul and Dream. We’ll post more in this category in the future. The Gestalt way with the dog as dream figure, as with all dreams figures, is to avoid defining the symbol. There’s no cooky-cutter answer to what a dream dog “means” – it’s your dog (if it’s your dream) and we can choose to see it as a living presence, within the night-time theatrical production that is your dream. We can enquire as to why such a presence occurs, and what its part is in the drama that’s playing out. Maybe you can role-play (or roll-play) your dream dog, see what s/he wants from you. If we take the dreamer as the holder of day-world consciousness then what other aspects of you are being constellated in your dream dog, and possibly want attention? Let’s also take into account dogs from an archetypal and mythological perspective. Dogs have a rich and ancient history as mythological presence. 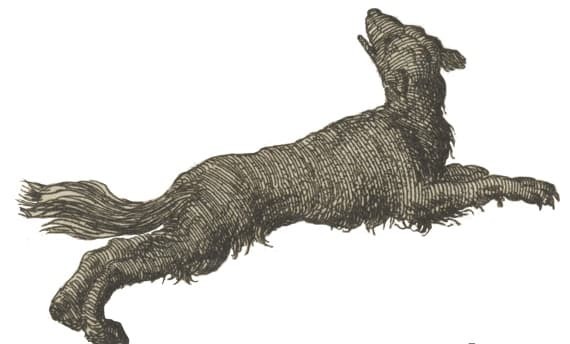 In Wikipedia, the category Mythological Dogs extends to 76 pages, from the well-known three-headed Cerberus to the lesser known but intriguing English Church Grim. The dogs represent consciousness “scenting” or “intuiting” the unconscious…It is as if the dogs were fascinated by the centre although they cannot see it. They seem to represent the fascination felt by the conscious mind. Is our dream dog “scenting” something we’re missing? …Tapping in to another way of see our current situation, a way that harks back to our unconscious wolf past, that is still a real part of us (and may be blocked from awareness by the “infrastructure” of either the City, or of our own sense of a constructed identity)? The appearance of Diana necessarily brings with it her hunting animal the dog, who represents her dark side. Her darkness shows itself in the fact that she is also a goddess of destruction and death, whose arrows never miss. She changed the hunter Actaeon, when he secretly watched her bathing, into a stag, and his own hounds, not recognizing him, thereupon tore him to pieces. The dark dog brings about the “destruction” of the hunter. In what ways does a “hunter” attitude sometimes have to be be deconstructed, ripped apart, chewed over and assimilated in an unexpected way? James Hillman studied animals in dreams for many years. He found that in most animal dreams the dreamer is trying to eradicate the animal, and/or the dreamer is seeing the animal as more dangerous than it turns out to be. We need to remember the potential conflict between a dreamer and his/her dream figures: and wonder what the other dream figures may have to offer us, in the dream production. We are happy in the kitchen, preparing a meal. Then my father-in-law says there’s an unwell dog in the lounge. We go into the lounge and a small fluffy dog is looking sick, lying down, in a huge puddle of very yellow pee. My father-in-law says there is far too much pee, and we have to look after the dog. The dreamer’s reflections were that he was surprised that he had a caring father-in-law part of himself (that felt empathy for the dog) and that he had a dog-part at all! A dog that needed some kind of attention, a little fluffy dog that was low to the ground. He began to see the pond of pee as a yellow traffic light, alerting him to this dog part of himself that he needed to take more notice of and nurture – a gentle part, non-complaining, but also somewhat lonely. I’ve been given a gift in some kind of ritual and now have to leave a place like Versailles with the gift held close to my chest and wrapped in a blanket. But as I pass through a vast courtyard there is a huge angry dark dog as high as an apartment block barking at me. Luckily I realise it’s behind a huge plate glass window and it can’t get me. I hurry away. Using Jung’s technique of active imagination to “dream the dream onwards”, the dreamer found that he could imagine, with some trepidation, that plate glass window being removed. He had no idea whether the dog would now annihilate him. But instead, the dog began bounding around him, circling him with joy, it’s huge ears flapping and its huge tongue hanging out! A bit like Jeff Koon’s Puppy. It had become a joyous god, and the dreamer realised he could be more joyous about the gift he had been given in the palace. He realised that blocking his joy meant it tended to come out as rage. Of course, dogs have always been known as “man’s best friend”. In fact, for some people, a dog is their one-and-only friend. The dog as pet is loyal, playful, forgiving, holds no grudges, and is always ready for a walk! I am riding in a small plastic car and suddenly the car turns into a small dog. We are being swallowed up by a cave in the road and it is filled with water. The dog seems to be leading me down and into the cave and I have to hang on. I can hear the voices of other woman down there in the inky water. For this woman the dog was a constant companion that was able to lead her somewhere she thought was dangerous, but had the voices of woman she did not yet know (but could meet as other parts of herself, parts conversant with the underworld). Melancholy, the Black Dog, being dog-tired, being thrown to the dogs, continually digging up bones to find the cause of depression… we touch our animal natures in this way; we revert to the pre-verbal. The sad dog may have a treasure to give us. The domesticated dog can be a way for us to come to our wild ancestors, to wolves, dingoes, jackals, mad meat-eating ancestral packs. In their realms are held the terrors of childhood, of abuse, of voracious and wild appetites. Dogs in dreams are mediators for and guides into these realms of anarchy and beastly terror. Guardians as well. The dog that eats raw meat, that pisses where it wishes, that knows of no artificiality, no ideologies, no romantic love, that keeps its nose to the ground: a foil to our sometimes haughty human aspirations. The dog can’t help loving the bones, or anything that looks like it. Burying them, digging them up, dealing in limbs that have been stripped of essentials (flesh). Dogs can take the forensic pathologist’s view, the precise dissection. Imagine! A close relative of Anubis asleep at the foot of your bed. The dog’s delectation with bones ranges far wider than Egypt. As we mentioned above, the dog has always been related to the underworld. Cerberus is the Hound of Hell, and dogs know when death is near. In our culture, the division between death and life is very distinct. Life is meant to be clean and pure; hence death is seen as unclean and rotting. The dog can be the modern reminder that death goes on beneath the surface, that ageing and entropy, despite all our expensive attempts to prevent it, is the truth. In what ways are we defending against this truth, and is our dream dog actually speaking this truth? We encourage you to not take fright or flight from your dogs in dreams, irrespective of what they look like and what they do in your dream. Instead welcome them as potential bringers of another, possibly more earthy, point of view – a point of view that can extend the range of possibilities of consciousness. James Hillman, “You Dirty Dog!” in Animal Presences.